Super Mario Maker, recently powered-up from its initial moniker of 'Mario Maker', was a huge part of Nintendo's E3 presence both this year and last. Just a few months ahead of its September release it still had plenty of new surprises in store for this year's show, and still managed to captivate attendees' imaginations. The interactive Super Mario Maker Show showcasing the game was mobbed with people every time we passed through Nintendo's booth, and though frequent appearances by Charles Martinet certainly didn't hurt, the crowd seemed just as excited by the game itself. We loved what we played at last year's E3, and the new demo on offer this time proved that it's earned its since-upgraded title - Super Mario Maker is shaping up to be a beautiful celebration of Nintendo's flagship series. When our Nintendo representative handed us the GamePad for Super Mario Maker, she offered up some excellent advice: "You can jump right in if you want, but my favourite part is the title screen!" Our interest piqued, we played around a bit and found some fun easter eggs right off the bat. On startup, the Super Mario Maker logo appears overlaid as Mario runs through a short stage in the background - but if you touch the D-Pad or the analogue stick, the logo fades away and you'll find yourself playing the level; reach the goalpost and the title screen returns. A later play session revealed another fun surprise: using the stylus on the GamePad's title screen paints in waves of Kamek's multicoloured magic wherever you touch, reminding us of Super Mario 64's pinchable polygon intro. These are little touches, but they're indicative of the love and care that's gone into making Super Mario Maker. They fit right in with the quirky spirit of the game - seen elsewhere in shaking objects with the stylus to change their properties, rather than selecting variants from a menu, for instance - and the playful, Mario Paint-style sense of creative wonder it inspires. After toying around with the 'Make' mode, which felt just as fresh and fun as we'd remembered, we jumped into the 'Play' section to try out some of the pre-made courses put together for the demo. The first two stages we played were tailor-made to showcase the new amiibo integration, and let us run through an obstacle course stage as Wii Fit Trainer, and a tricky underground dungeon level as Link. The 8-bit costumes, donned by picking up a Mystery Mushroom, were instantly appealing and bursting with details - pressing 'Up' on the D-Pad sent Wii Fit Trainer into a confident Tree Pose, for instance, and her jumps were accompanied by vocal cues of 'Up! Down!' coming from the GamePad's speakers. You'll be able to add in amiibo mushrooms of specific characters to your created levels, which is fantastic - we imagine players will come up with plenty of side-scrolling tributes to the various worlds represented by Nintendo's figures. Once we'd finished our workout with Wii Fit Trainer and reached the end of the temple as Link, we went back to basics and played through some memorable new stages as Mario. One, named 'Koopa 101', tested (and improved!) our knowledge of Koopa mechanics, and we had to stomp with care and purpose to open up a path to the goal. 'Escape from the Giant Wiggler' re-imagined Mario's caterpillar nemesis as a kraken in an underwater stage, presenting a demanding gauntlet of trial-and-error challenges to overcome. Another level, '10 Seconds or Less', was a mad-dash to the finish with a ten-second timer, requiring a taped-down run button and a perfectly-timed jump to pull off. Similarly demanding was 'Leap of Faith', a short stage consisting of a single blind jump, with spikes blocking the way to safety save for one one-Mario-wide section - it took us dozens of tries, but we managed it eventually, with thanks to our obliging Nintendo representative. Perhaps our favourite of all the levels we played was also the easiest: 'Automatic Mario v4' was an amazingly intricate Rube Goldberg machine that used moving platforms, conveyor belts, bounce blocks, Bob-ombs, Bullet Bills, Buzzies, and Thwomps to get Mario safely from the stage start to the goal, provided the player didn't touch a single button. It was mesmerizing to watch, and supremely smile-inducing. We had a great time playing through all of these levels, but what impressed us most was how different each one felt from the next. True, several tended towards the super-hard, 'trapformer' side of the spectrum (like 'Leap of Faith'), or were built around a single clever concept ('10 Seconds or Less'), but we also played through quite a few stages that just felt like fun, creative Mario levels. 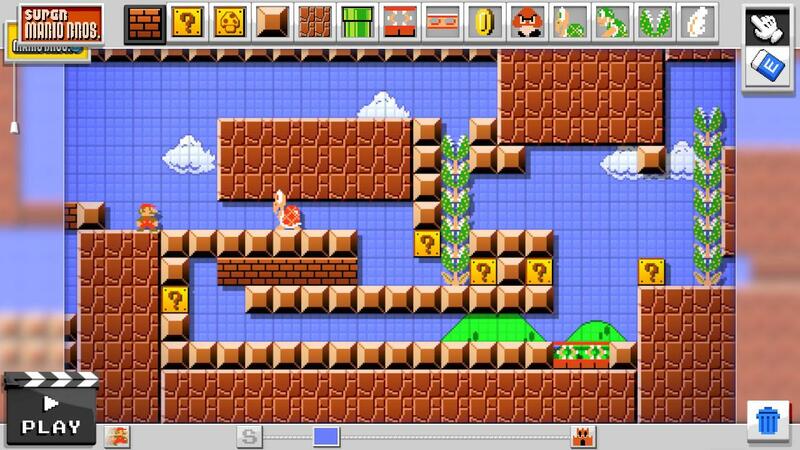 Most exciting of all, these levels really showcased the idea of Super Mario Maker as a platform. We have no doubts about the potential for greatness from fan-created stages, and Nintendo seems committed to making levels easy to share and distribute, via 16-character codes as well as direct in-game channels. Our representative also mentioned that players will be able to share levels within smaller, user-defined communities, and we already can't wait to see the first Nintendo Life level packs go live! Outside of the new pre-made stages, Super Mario Maker is sporting an improved interface compared to last year's build - friendly, fun, and intuitive - along with the ability to swap between four different graphical filters on the fly: Super Mario Bros., Super Mario Bros. 3, Super Mario World, and New Super Mario Bros. U. Each of these look great - the slight drop shadow on foreground sprites in the 8-bit modes is an especially wonderful touch - and newer elements of the series have been retrofitted to older graphical styles in thoughtful ways. There were also a few new modes in this demo, including the '10 Mario Challenge', which tasks players with finishing a series of eight random stages using ten lives or less. We'd love to tell you what lies at the end as a reward, but our third stage was 'Leap of Faith', and we didn't stand a chance. It's not long now before Super Mario Maker makes its retail debut, and we're more excited than ever to get to work in the final version. Mario Maker has always been a great idea, and with all the polish and personality on display in this latest build, it's looking like it's going to be a truly great game as well. With Super Mario Maker, Nintendo is giving us much more than a Mario level editor - it's giving us a way to celebrate the series, in typically joyous style. Before E3, I was still on the fence. Now it's the game I'm most excited for, looking super fun. Excellent stuff as always Morgan, I'm still massively jealous that you got your hands on it though! I can't believe Nintendo actually managed to make me hyped for a Mario game. That hasn't happened since Galaxy 1. @Zipmon Excellent preview. I know this game isn't for everyone, but I think last week's NWC sold this game to a huge amount of people. It's easily my most anticipated game of the fall. The fact that it'll include those NWC levels and that users cannot make levels they themselves cannot beat but still make them wild and difficult) makes me extremely pleased. I think I'm gonna be playing other peoples courses more than I'm gonna be making my own... Provided you can download other users' courses onto your system ... Which is fine! Is the bundle with the book limited edition? If so I expect it to be snapped up by scalpers within minutes. Why are there no bosses in Super Mario Maker? I'll be downloading this as soon as it hits eShop. @Aneira I'm pretty sure you can add as many Bowsers as you like to a stage. I need this game. Need. NEED. NEED! What I love about Mario games, is even if you lose a life, or a lot, I still want to try. I put the physical copy on pre-order. That's a pretty big deal for me nowadays. It'll be fun to make only marginally good levels for a while, then make some good ones, then just stop playing altogether. I'll be getting this, but I'm not too excited. I watched the NWC footage, and I get why people are excited, but it reminded me of mod-hacking, trying to make things as crazy and as random as possible. I'd take a regular Mario over this, even another in the NSMB line. @Peach64 I do agree that I don't like the way levels seem to randomly built during what I saw on Treehouse Live streams. I'm going to be focusing on producing traditional Mario style levels. @Peach64 I know I won't be making super crazy levels. That will always be a thing, but I expect good solid interesting levels to have quite a following. Not everyone is awesome at Mario. Judging from what we've already seen, it's going to be a wide variety. While I was excited to watch the NWC levels I know myself we'll enough to know any hype I have will fade once I build a level or 2. I spent 2-3 hours with Mine craft before I was done. My son was super excited for Splatoon but he's only played that for 2 hours and now he's back to Minecraft, b/c when you're 10 you want everything. 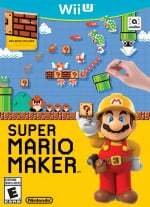 Both my sons have said this was a day 1 since last year, and I think it will be, but the $60 price for a level editor w/o a game may have them decide to spend their money on Yoshi Wooly World and get this for Christmas. And here's why. Why isn't multilayer mentioned in the article? Every single Star fox article mentions multiplayer. The last 3 main Mario games on home consoles my family played were all 4 person multiplayer - NSMBW, NSMBU, SM3DW. Since this game has a NSMBU level design I would assume multiplayer, but this entire article never even mentions it once. Is it a yes? No? Maybe? For a $60 2D Wii U Mario game I expect couch multiplayer, and so do my kids. Are there any options in the game to make enjoyable levels? I do like the controllable cloud as a start. Infinite lives check points like in LBP would motivate me to play levels my kids make. Can we play an entire level as giant star fireball Mario and go all Godzilla on Bowers kingdom for a change? If I can't have fun playin multiplayer w/ my kids I just want to wail on the bad guys mercilessly. If I want to die over and over I'll go play Tropical Freeze. If Nintendolife got to try this out last year, wouldn't it be more accurate to call it a second impression? I can't wait to try this out. I've never been big on creating levels, but I assume my wife and I can have some fun with this. @Peach64 Even though I think the game is going to be amazing, I still want more 2D Mario platformers. They will always have more variety, and an (from the mods that I have played) fairer difficulty curve. My most anticipated game of the year. I'll be both building and playing levels of all kinds. September can't come fast enough (and luckily there will be a three-month gap between this and Xenoblade X). @rjejr Agreed. Multiplayer needs to happen. Especially amiibo multiplayer. I want to play as Samus and Kirby and run through the mushroom kingdom! This, Xenoblade, and Star Fox is my must, must haves for now. The Nintendo World Championship made this game looked really fun, even though I'm the most uncreative person that probably exist. I really hope there is DLC for this to expand it's capabilities, like adding SMB2 tile sets and mechanics. Even better would be Yoshi's Island too, but that might be a lot more complicated. Is this "game" really going to be $60 or is that a placeholder? @shigulicious it's currently £44.99 in the UK on Amazon and I'd be surprised if it remained that high come release. That said Nintendo don't set prices for games and consoles over here. @FragRed thanks for the response. It's at $60 here on amazon US and that's really high IMO for what is basically an app. I really hope it sells for half that. It sounds like Nintendo really hit it with this one. From all I'm hearing the skies the limit with what you can do and the interface is supposed to be very good. The book is a nice addd on too. "Super Mario Maker" always looked like a US$39.99 game, like "Toad Treasure Tracker", but the way Nintendo has been promoting the game (taking up a big chunk of the E3 Digital Event) it seems they are pushing it as a must have triple AAA title (which it is not). I will most likely get this game. Mostly for my boys to start tinkering with. There is one feature that would make it a slam dunk for me... an overworld editor. If we could make an overworld map like SMW or SMB3, and link them to levels we create... sold! Who knows, the Nintendo community might even remind Nintendo of what a great overworld map looks like again! So, can you wall jump in 8 and 16-bit Mario? I figure you have to, since it might break some stage designs. Either way, I'm excited. I'm generally a "good at ideas, bad at execution" kind of person, but this looks accessible. Hopefully those 8-bit Mario amiibo aren't a pain the the rear to get. £44.99 is WAAAAY to much for this game. [email protected]£30.00 (or less) was the right price. This game should be the same price... or less. I understand sometimes the worth of something is what you are willing to pay for it. Some people will willingly pay £60.00 or $100US for this game. Nothing wrong with that but I won't pay more than £30 for it. At that price it is not going to do well in the UK. I don't understand why people are saying that it's an editor without a game. There will be 10 Mario games worth of levels in the first few weeks. Even factoring in the unconnected nature of the individual levels, the wide variety shown already is going to rival past Mario games and it has potentially many times more hours of game play than other full-retail price Mario games. In addition, you'll be able to focus on the types of Mario stages you like. For those who like insane challenges, there's not much from Nintendo these days. Plus, those who miss the old feeling of Super Mario World stages can get that adventure-puzzle feeling again. It will all be well-represented as the number of people with mario fantasies about what they think is best continue to create levels to play. I do understand the hesitation for those that don't gravitate to the editing, but I've seen a lot of editors and I think this one will be potentially addictive for even the minimally creative. So, I think it is worth the same price as Splatoon. A full-retail price of $60 like we pay here in NA. Plus, the physical version even comes with a nice hardcover idea book. If you aren't into 2D Mario platformers, then yeah I guess this isn't for you. I'm not sure what constitutes a AAA game, but honestly I measure these things by hours of full-on enjoyment and Splatoon is going to rival my favorites, and if I know myself well enough this one will, too. Multiplayer would be a great addition, though, I agree with that. You can't wall jump in those versions. Many game play elements are different. The maps you download stay in the mode they were created in, so there is no conflict with ability to complete them because you'll have the game play rules you need. This e3 really peeked my interest in this even more. Very excited. Curious though. Do the amiibos only work with 8 bit Mario? I plan on using the Super Mario World style most for levels. @rjejr if there was multiplayer, Nintendo would have mentioned it by now, I think. Unless they are holding it as a surprise for a Nintendo Direct, I'd say you're out of luck. As far as enemy beat-down levels, I imagine there will be a whole swath of those in no time. I'll make a few, just for you. Just remind me on release day! @Whopper744 Amiibo characters only work in 8-bit mode as far as I could tell from what a Treehouse person said during the last live demonstration. For those worried about unlocking them for use in your levels. Two notes: you can unlock them without Amiibo - saw a screenshot but don't know how that works exactly. Also - they work in user-created levels you download. In other words, everyone will get to play levels with the amiibo characters even if you never buy an amiibo. In fact, it should be fun to see people try to theme levels around the specific characters. What would a true Wii Fit Trainer level be like, I wonder. 8 bit Bowser looked so much happier than today. Look at that possum like smile. I want the CE that comes with an amiibo! @aaronsullivan Yeah I'm not much of a designer but I'll get this just to play the levels people make. And there will be tons, people have already been hacking Mario ROMs for years, but now there is finally an intuitive platform to easily edit and share them between people. I think there will be plenty of value in the title. @aaronsullivan But of those levels, how much would the be good enough? I foresee Kaizo spam and trash levels being dominant. I don't see how this is 60$. I like doig SMB3 oveworlds, because the tile system and how it works is awesome. SMW would be cool too. Like one could build custom levels with the oveworld being the icing of the cake. People could distribute level packs bundled in an overworld. That's both disappointing and good to hear. I figured they had found some way to have the exact same physics and platforming mechanics across styles, and that it was a purely cosmetic difference. What IS cross-compatible within all styles? I know Yoshi is, so I would assume most/ all powerups would be. I want my superior SMB 3 powerups dangit. EDIT: OK so Yoshi ISN'T in all styles... I thought they said he would be? @aaronsullivan - "Just remind me on release day!" Or Christmas, depending on when we get the game. And there was another game that announced recently that the multilayer didn't get anounced until much later. I'm pretty sure it was Kirby's Rainbow Curse. They said at the beginning it would only be 1 player b/c you needed to draw on the Gamepad, but then months before it released they showed off the multiplayer. I could see them dong that w/ this if you can only make it w/ 1 player - the part they are showing off - but play the levels w/ 2 player. Hope so anyway. Game would look weird w/ little bubbles floating abut w/o anybody inside them. That's where my wife's character usually spends most of her time when we do 4 player, we only pop her out when we need her. But on point, the article should still mention multiplayer, it's a Ntineod game on the Wii U, and most of those have multiplayer, as did the last 2 NSMB.games on Wii and Wii U. I think it should be mentioned 1 way or the other, even if the author doesn't know, then say that. @Gridatttack Exactly! We the community could create entire worlds of carefully crafted themed levels tied together by similarly themed overworlds. Can you imagine? The creativity would extend to the next level when you think in terms of creating worlds vs. Just levels. @Samuel-Flutter - My wife doesn't run thru anything, she only floats in bubbles, but at least the kids feel like she is playing w/ us. @NinjaWaddleDee - " I want to play as Samus and Kirby and run through the mushroom kingdom!" Stop making sense, you know Ninteod doesn't want us playing as amiibo in games. Unless they are really bad Animal Crossing board games. And Codename STEAM w/ amiibo they only made 3 of. @rjejr yeah I know right? Not only that, but they limited amiibo characters to special powerups, instead of letting us just play as them continually! This games looks like it's going to be genuinely great fun but I have to be a bit honest here and say that imo it looks pretty rough around the edges in terms of some of the general presentation; the various menus, options screens and GUI stuff. Like some kinda haphazardly thrown together cash-grab title, with a slightly cheap "Flash" look to all the interface/menu stuff, created to make a few easy bucks off obsessive fans—especially considering this is actually an official first party release and not some fan/homebrew creation. I mean the core game/content is clearly there, so it's not like it's not delivering in terms of fun, but I just think Nintendo really skimped out in terms of that extra layer of "Nintendo" polish. The changes/differences are subtle, and most people probably missed them, but I was actually paying attention. Also; it's more the other menus and screens where the new style is a bit more obvious and you get to see that overall kinda "Flash" look a bit better. Again however, this is just another area/sign where it's apparent to me that Nintendo is ever so slightly half-*ssing it—considering how genuinely special this title has the potential to be imo. So yeah; Super Mario Maker is going to be great fun, it's the Wii U game I most want to play, but I just always get the feeling these days that Nintendo never quite goes that extra mile anymore, and to me, going that extra mile is what made Nintendo basically better than almost every other developer in its heyday, and it's what made me fall in love with Nintendo in the first place. It's a shame Nintendo clearly doesn't want/try to reach those levels of all-round of polish and pure sublimeness quite so much and quite so often these days—I think it would have a lot more fans right now if it did and I think it would have sold a lot more Wii U systems too, if it also took the same kind of attitude to its consoles and every area of its design and implementation as I expect from its games. @aaronsullivan A Wii Fit Trainer level would involve a lot of repetition and fire... you know, so you can feel the burn. I'll be making a bunch of simple levels for my four year old and some a little bit more complicated for my two older kids. And I want to make a level where cannons shoot out countless mystery mushrooms as you make a mad dash to the goal. @Kirk If Amiibo were actually required in this game, then it would be seen as a huge fail. Ammibo are selling well enough as it is anyway that Nintendo don't need to make them a requirement. The interface design is clearly better in every way including the clarity of the imagery and especially the separation of items and grouping. Some of the old school pixel art in that original was just poor, IMO. I guess it's "flash" because it has some simple abstracted flat design? That style was long before flash and really it doesn't remind of the haphazardly drawn flash animations that have the negative connotation you are suggesting. Bogging down the development of this game with 40+ unique gameplay techniques and making them work with so many different mario level blocks and enemies in unique ways would be a misguided feature at this point and a large investment of time, money and energy for what would really be a totally different idea and game. It could be a cool game idea, but this is Super Mario Maker. Focusing the design on 4 Mario games was a much better plan. The extra characters from Amiibo still look fun, with unique sounds, animation, and finishing music and will add some nice variety without making people feel like they are missing out if they don't own Amiibo. A good balance. @DarthNocturnal Mostly it's the abilities of Mario himself are different. For instance, he can't wall jump in anything but the NSMB version. He can only do the spin ground attack in Super Mario World version, but there are some stage differences like the brick blocks being those flippy yellow things in Super Mario World. I think it's great they kept them distinct as it would be more disappointing if it was completely cosmetic. What's also cool is they have made many enemies like the koopa-wizard guy 8-bit and others which have never been in those games. @Gridatttack Well, there probably won't be the kind of levels that make up the first world and are just for introducing basic mechanics like most Mario games have. Mario games have maybe 80 levels? How long do you think it will take to have 80 good stages online. I give it a week. Many of the levels will instantly have things we haven't seen before like enemies that have never been 8-bit and combinations of elements we haven't seen. It's plenty of all new stuff. There are people who have spent years doing hacks and worked on levels outside of official means and for the first time they will have a tool that general audiences can take notice of. I'm making an educated guess here that there will be impressive and fun stuff to play immediately. Again, if someone doesn't like this type of gaming to begin with it's not worth it, but I think it's a fair price. The console should get a price drop as soon as possible though. @rjejr You are right about the late multiplayer announcement and that would be a great addition. I just wouldn't expect it. 3 out of the 4 games they are representing here were single player games. The possibilities for cool multiplayer stages would be great, though, because people could make some stages where cooperation was necessary which Nintendo really never did with the 2D Super Mario games. @blackice85 I missed your comment but I was thinking the same thing. There is already a community primed for this. Even though you don't think of yourself as much of a designer you are going to try right? Did you see the Treehouse Live presentation where they focused on the editor more? I think many people will be surprised by how fun it is to make some stages even if they don't feel confident enough to share them outside their home. @aaronsullivan Oh I'll play with it sure, but I'm typically not the sort who makes mods or levels or anything. I did like how fast and easy it looked too, this would probably be a pain without the stylus and touchscreen. I'm just excited that we'll have a more centralized place to share levels. Running hacked roms isn't that hard but it's not intuitive for most people, if they're even aware of them in the first place. I can't wait to see what awesome levels people will make. I can't wait to see what awesome levels people will make. Wish I had a Wii U for this. @ottospooky Same here. I've never really been big on level editors and that sort of thing. But I am pumped to see what the public can dream up. This is basically an infinite Mario game. It is essentially the last ever 2D Mario game, since I'm not sure what else they can do with the franchise after this. And Frankly, I'm okay with that. They'll probably release versions of Mario Maker for future hardware. And honestly, a level editor for smartphones (or at least 3DS/future handheld system) would be absolutely brilliant. You're bored waiting at the doctor? Draw up a Mario level to play when you get home. I'm a little sad that the Koopalings, Reznor, Boom Boom and the other bosses are not part of this game though I will still get it and hopefully the physical. As much as the game didnt look AS good at e3 last year, that changed. They added Bowser shakin to Bowser Jr., and Kamek! Genius! And what really hit it off is playing as other characters from different characters. But, that 8-bit Mario Amiibo, I think Amiibo and SMM will get the Mario Kart 8 curse, xD. But, I had an idea, I will make a level where it has a huge cake, and coins spelling out 30 BDAY! Just need to get my hands on this game!!! I am going to make a Sonic-amiibo level, ideally with the finale being against Bowser flying in a clown car, with a chain chomp attached to the bottom. @aaronsullivan I suppose you're right. My only problem is that at first, there isn't enough tangible game content to justify the price point. As for we ROM hackers, we don't know if we should get this, because editing the base games provides more content. But I suppose on the plus side is that there is a wider audience. The audience is a problem on ROM hacks, since only a few people know they exist. I suppose I might get this when someone is reselling it for a lower price. I'm actually a bit excited for this, as I always wanted to make a SMB1 hack, but the limitations of the games kept me back. I like the UI very much. It's way better than all the Buttons and stuff in the regular Nintendo Interfaces. Good Job! @aaronsullivan Guess we just see differently on this one. I can't really argue with your points since I think it's perfectly fair to come at the design with different opinions on the overall aesthetic in this case and I agree that it would certainly take more work to add in the various stuff I mentioned. I do however still think there's a bit of—"Let's just get it done quickly and to a bare minimum level of polish that most loyal Nintendo fans will be happy enough with but that won't push our dev team/resources or take any more time than absolutely necessary. Most players will be so excited by the prospect of creating their own Mario levels that they won't even really pay attention to the smaller details like the menu/UI design anyway. Also; let's just chuck in some simple amiibo stuff but something that doesn't take too much time or effort either. "—kind of attitude to the menus/interface and the amiibo stuff. @MadAdam81 Yeah; it's just an extra little feature—something throwaway. Still; I think if they're gonna bother doing something in the first place then why not really go for it. Sometimes I'd rather not have some random feature or element at all, rather than have something that feels a bit half-*ssed and gimmicky. It's like I'd more often than not choose to have less, but what's there is perfect, over more and some of what's there is flawed. To me, more is only ever better if it's done with the level of love and polish it deserves. @earthboundlink Because it doesn't have any of the cool stuff that wraps around the main levels—things like the overworld/map, the secrets and shortcuts through the map, things like the storing and management of extra power-ups, or even the basic story elements; all the stuff that really fleshes out the experience and kinda gives it meaning—they can still make a new 2D/2.5D Mario game that feels like a proper complete experience imo. Just having a basic level editor is simply not the same as experiencing something like Super Mario Bros 3 or Super Mario World in all their full glory, as far as I'm concerned. Those games actually make you feel like you've went on a proper journey/adventure through the Mushroom kingdom and completed a hero's quest to defeat Bowser and save the princess. Having a simple level editor as seen in Super Mario Maker does however mean I kinda expect to see a level editor in new 2D/2.5D Mario games going forward though. It would feel a little bit cheap if they didn't have it as an option in future 2D/2.5D Mario games, now that we've had a taste and in truth, we all know it's pretty easy to implement such a thing—certainly if they stick with the really simple design of these games. @Kirk Well, I'm personally seeing quite a bit of love put into this. The bare minimum could be so, so much less. In fact, the initial reveal I imagined that the different games only changed things cosmetically and they were going to find some common middle ground for controls between the games. Didn't expect the trajectory tracking, the fun methods of experimentation, the ease of going back and forth between editing and playing, the combinations and extent to which things can be customized. On all these things we'll just have to subjectively disagree. I do agree with you about @earthboundlink being wrong about the end of the 2D Marios. Not a chance. One exciting element to this editor being available is that the next 2D Mario is going to have to stand out and probably focus on all the things that Super Mario Maker doesn't yet allow players to do easily. Many of which you mentioned. People will try to number their maps and make them connected and tell stories anyway — let's not underestimate them — but whatever Nintendo team works on the next 2D Mario will be challenged and, I think, inspired by what players come up with. "What do we do to look fresh and new against all this?!" On top of all that, isn't this game already succeeding in bringing a wider audience back to thinking about the old classic game play style with the NWC getting some play around the internet? No, it's not the end by a long shot. I'd wager the next 2D Mario will be a stand out. @aaronsullivan - "3 out of the 4 games they are representing here were single player games." And the 4th was ACaF, so they kind of owe us in SMM. Do you think it's backwards that they announced 2 multiplayer games for 3DS - the handheld single player experience - in Zelda and Metroid - while making home console couch co-op friendly games single player? I know Nintneod wants to try new things, but one reason I like home consoles over handhelds is - buy 1 copy of a game, 4 people play it together on the couch. Or at least 2 people, namely my kids or my wife and I. Having SMM, XCX and Starfox single player seems too weird. I'm totally ok w/ a JRPG being offline single player, Xenoblade Chronicles might be JRPG perfection, and that's my genre of choice the past 17 years. But a 2D Mario game, and a space dogfighting game? They didn't put Samus in Metroid b/c it's 4 players, that's what they said. Well Starfox has 4 airwings in the video I saw. Single player for that is almost insulting. New things - like Spaltoon - are ok. New things in general are ok, but you have to give the Wii U something other than ACaF. Really, just tack-on multiplayer to every game, like all those Sony series do - Uncharted, God of War - at least then you can say you tried. I'm considering a PS4 for SW:Battlefornt. That has couch co-op trials and survival - split screen - and man it graphically looks so good. I'd get it on PS3 just for offline if it was on that system. OK, sorry for the rant, (apparently still not over E3 and the splatfest postponement) really just wanted your opinion on focusing so much on multiplayer on handheld and single player on home console. See, StarFox was always single player to me. The multiplayer on 64 was pretty lame. Never enjoyed that much. The prospect of playing StarFox split screen isn't too exciting either and normally I'm all for that even with lower frame rates like with Hyrule Warriors. I always prefer playing with my kids on that one even though it takes a noticeable hit in graphics and frame rate. I also guess because you are already supposed to be looking at two screens for Star Fox, what would multiplayer even be? Online maybe would be cool? It's not all that rational. Also, dogfighting is very hard to get right in multiplayer as obvious as it seems as a premise. I mean to make it fun and not just chasing each other in endless circles. 3DS and DS have had local multiplayer going for a long time and it is a great advantage that each person has their own screen and I'm pretty sure you only need on Zelda Triforce Heroes cart to play multiplayer with that one at least. You know me, though. I was right with you on desire and hopes for more than one GamePad early on. I accepted pretty early (after seeing performance in Sonic Racing) that it would likely never happen, but the prospect of games with many players in one room each with their own screen and playing one game on one console is certainly attractive, still. I hold out some hope, partially thanks to you and your kirby comment, that we might get multiplayer in Super Mario Maker. It could be great. Maybe hold it off as a new feature to get excited about closer to release. But don't you feel like they pulled out all the stops for that game this E3? @rjejr Oh and I meant 3 out of the 4 Mario games being represented in Super Mario Maker were single player only. Just for clarification. Animal Crossing Amiibo Festival has a lot of 'splaining to do, though! Doesn't there have to be much more to that?! I mean we just got Mario Party with that amiibo line and that was pretty meh overall. I mean my kids had some fun with it but I never should have bought that. And now a sequel!? With no mini games? Is it free? It has to be free. @aaronsullivan - "that we might get multiplayer in Super Mario Maker"
I agree w/ you about Starfox, its probably OK single player, but then what is the big family Wii U game for the holidays except ACaF? See I'm right about SKayldners Superchargers amiibo in the Direct, Nintneod is admitting defeat and wants us to buy that this holiday for couch co-op, 2 versions normal on Wii U and racing on Wii. @aaronsullivan Yeah; I'm exaggerating when I say it's the 'bare minimum' but I think Nintendo is def holding back on really just pushing the boat out on most of its titles these days, including this game. I mean even with something like say Super Mario 3D world—that to the untrained eye would surely look like it was about as complete, fully realised and polished as any Mario game could be—I think Nintendo got by with having basically floating obstacle courses on pretty much empty backgrounds. Pretty underwhelming and uninspired; regardless of how brilliant and creative the actual obstacle course themselves were (and they were). It was the easy way of quickly and cheaply building lots of levels imo; enough to make up a full game. To me, it was too obvious Nintendo was trying to cut corners in ways it deemed unimportant—but I think they are extremely important. If it were done "properly', as I see it, and in-keeping with the original Super Mario World, then the surrounding background areas of the levels themselves would have given the player some sense that they exist beyond just the area you are immediately playing in. They should have visually been part of a much bigger world, even if you never got to actually play in it directly, or a least given you the sense that they were. To me, it's very obvious that for most of its modern games, Nintendo is kinda cheaping out and taking the easy option(s) to a degree—going for a quick and cheap sort of modular approach to game design and game creation in many ways; with the "bare minimum" of bells and whistles—that imo takes away any sense of true immersion and magic in these worlds it's supposed to be creating and asking the player to become immersed and fully engrossed in. It's like the developers at Nintendo just say "Well that's not a playable part of the level or part of the core gameplay experience, so let's not bother making it. That will save us some dev time and money, and we can churn out these games a bit quicker." for certain titles; which I think is missing the point in many ways. Or in some cases it doesn't even try at all and just creates some crappy spin-off throwaway games experience, that it probably cobbled together in under a year, and slaps a big franchise name on it instead, rather than giving fans what they actually want. I mean if you REALLY analyse it; then games like Super Mario Bros 3, Super Mario World and Yoshi's Island, all did a much better job of actually crafting believable, living and breathing worlds in their respective level designs (even being in 2D), than the very latest full 3D game in the Mario series, which is a bit sad really. I see similar shades of that "cheaping out" mentality in some elements of Super Mario Maker too, and it just makes me a bit sad because I know that when Nintendo is at its absolute best it can create wondrous immersive worlds that basically no one can touch. That's all I really want from it—the real magic and heights I know it's capable of reaching—because I've seen it do so before; many times. I just want Nintendo to genuinely blow me away again. @Kirk Yeah, I think you are making a big deal over something that I'd like to see again in some Mario games, but is no indicator whatsoever of "cheaping out" but rather a design focus. Immediate fun and clarity for group play won out in that one. I mean I do think I know what you mean with especially the original Super Mario World. The digging up of secrets and exploring different techniques for gathering up kinds of Yoshis and fun ways to get easy extra lives. The extensive secret areas and paths to advance. The atmosphere in the caves and the puzzling level design. That was fun and involving and somewhat transportive. For me, Super Mario Bros. 3 wasn't a believable living and breathing world at all, though. Yoshi's Island. Sort of. Really love all those games, though. @rjejr I love all the subtle slights against the game. lol. "level editor in search of a game" as if Super Mario Bros. isn't one of the most recognizable games ever made and there aren't going to be hundreds of stages to play. Also, "taking things out" as if every Mario game going forward was promised to focus on multiplayer. I just don't think sequels are required to have everything the predecessor had. I think we see things differently that way. Anyway, it will be interesting to see what Nintendo's plans are with what I'd hope would be a series of Maker games. And hey, maybe there'll be a cherry power up amiibo that unlocks multiplayer in Super Mario Maker — please, no. @Gridatttack Please do! The more quality the better and you've got to admit that a bigger audience and tons of competition is going to bring out the best in you, right? I hope there's a way to directly share so we can post on here. @aaronsullivan I think you're not fully understanding what I mean when I say "living breathing world". I don't mean in terms of the gameplay but more just in terms of the artistic representation of these worlds, as shown via the level graphics and visual designs elements. In those 2D games the extra background art, sometimes done with multiple layers of parallax, created the sense that the world went on beyond the confines of the 2D plane (into the distance), beyond the edge of the screen and the platforms you were specifically jumping on. You believed you were playing in part of a much bigger world that existed beyond the confines of the level and screen. You were actually in the Mushroom Kingdom or on Yoshi's Island. In Super Mario 3D World it's abundantly obvious you're just on a limited floating obstacle course most of the time; so that illusion of actually being in a place, that suspension of disbelief, is basically destroyed. You're clearly not on/in any proper world at all—unless that "world" is just a series of obvious video game courses floating over basically empty backgrounds. It betrays the simple video game level/gameplay design and It makes the game feel "smaller" and more like a little series of simple platforming challenges than a proper Mario "World"—a living breathing world that the player can escape into and fully immersive themselves in. You're not Mario running and jumping through the Mushroom Kingdom on a great adventure, slowly making your way to Bowser's castle, where you will eventually challenge and beat him then and save the princess and the entire Mushroom Kingdom. You're just a dude beating a series of disconnected assault courses and simple platforming challenges. 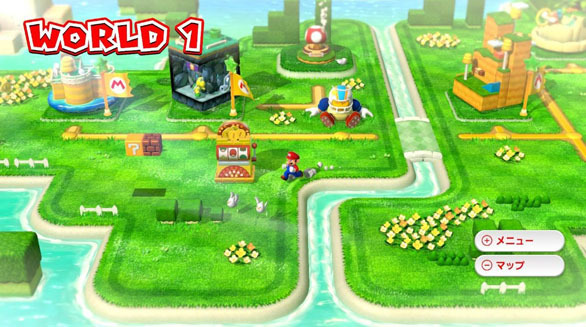 Even the map screen that tries to pretend the levels are connected in some larger way often fails at doing so in Super Mario 3D World because it just mixes in totally different level designs/themes within each area of the map that shouldn't be together—unlike the maps on say Super Mario Bros 3 and Super Mario World, which far more effectively created the sense that each map zone was its own area, desert area of cloud area, with a strong theme and aesthetic that was actually reflected in the levels for that world too (or at least as they were represented on the map). They actually looked liked part of the map too, like it was kinda a proper representation of area, whereas in Super Mario 3D World's map it's just floating icons that don't even look properly connected to the map. Once again, breaking that sense of immersion and that it's a proper living and breathing world. Well, I appreciate the effort you are going through to explain yourself, but that's largely what I thought you meant. I mentioned the interactivity of the map as a way that made it feel more involving and alive in Super Mario World in addition to things you are talking about and I shortened my post a bit, but I still feel the same way. My contention is that it wasn't "cheaping out" but a design focus. I actually found the Super Mario 3D World felt a bit adventurous and the stages and maps had a strong theme that often matched with the stages and activities. It did have the separation by those glass pipes and, like I was trying to suggest, by design it is very clear were borders and important locations are which makes it feel a bit more "interface" and less "world" but, really, I have a feeling it is you that has changed more than the presentation. So it's a bit of both. Especially when you bring up Super Mario Bros. 3 which uses a lot of the same design cues, is highly abstracted, and only your imagination can connect them into a wider world, ignoring the giant squares, numbers, and rectangle roads, artificial barriers, floating square islands to feel a living, breathing, world. I don't know. I just come back, again, to this being a tangible difference but to a lesser degree than you are making it out to be and don't see it as a sign of "cheaping out". Yeah, it does feel a bit more like obstacle courses in 3D World but I'd say that's a design decision to focus on making it work for 4-players and just the perspective itself. Plus, Super Mario 3 really felt like obstacle courses, too, to me. SMW was more exploratory with its levels. I digress... again. I have no idea how old you are or what your history with the games is, but I know I see these new games through the eyes of my kids, quite a bit. Helps me fight the nostalgia goggles. We play through many of the old games, too. Maybe we'll go back to the original Super Mario World again and I'll see what they think. I toyed with posting pictures, but I think we've said all that can be said at this point. lol. @aaronsullivan Well it is a design "focus" or decision to a degree but I think my contention is it's the wrong focus/decision in a few ways. In both the SMB3 and SMW map examples I think the designs just work better. Obviously SMB3 was the first Mario game with a proper map, so it's simpler by design, but it looks almost like an old paper map or military strategy board to me; with the key locations and strongholds marked on it. This works well visually and everything makes sense in the context of the design of that particular map imo. Almost like everything was built to scale as a model set that you could actually have sitting on your desk; to help you plan your adventure. It also actually goes pretty well with the whole stage/theatre design motif that permeates throughout SMB3's levels imo. You could imagine this like a Shakespeare play with the board map sitting centre stage, and the players moving their Mario pieces on it. Then that ties into the levels you actually play through relative to each location too—you get desert levels on the desert map, cloud levels on the cloud map, water levels next to water indicators, and so on. In SMW it looks almost like a zoomed out image of an actual real place/location from Mario's world (in this case Yoshi's Island). Like you could be looking at basically an overhead view of these locations at a slightly distance and Mario is genuinely moving across them as he moves from level to level. It really helps make the world feel real, and everything seems to make sense with where it is placed and works in the correct context with everything around it too. Then that ties into the levels you actually play through relative to each location too. If there's water on the map then the level you enter will be a water level, and importantly, the water on the map where that level is looks like it would actually be there naturally. In both those SM3DW maps you have a kinda generic looking 3D modelled landscape with floating miniature dioramas all over the place. It doesn't look like either some kind of representation of a real map or a zoomed out view of an actual area. It's just a generic Level Select Screen, that tries to ape what was achieved brilliantly in the previous Mario games but doesn't do it quite as well. It doesn't look so much like a map or zoomed out view of the world as it does a simply and quickly rendered screen to stick the random rendered level icons on and then just quickly chuck in a few paths to make it look like they are even remotely connected. Why would a bunch of floating 3D dioramas even be connected by paths (and why are they always slightly off the path anyway)? If you ignore the fact it's in 3D, so "technically" it's more "impressive", then it's a weaker design. It doesn't help the world feel more real, like it actually exits. It actually undermines the suspension of disbelief slightly. Also; many of the levels simply don't match theme of the map they are floating over; again breaking the cohesion and suspension of disbelief to a degree. The maps in both SMB3 and SMW look like natural extensions of their worlds/levels and the maps in SM3DW look like a bit less like intelligent design and more like lazy copycat design that slightly misses what made the original maps so cool and appealing in the first place. You also have to take into account time; in that we should naturally expect the maps designs to actually improve over time, in 2015 they should look/feel even more cohesive/unifying and convincing than they did 20-odd years ago, instead of going backwards in many ways (other than graphics tech). Does any of that make sense to you? @Kirk yes. And it's still just the same thing we have been disagreeing about since the beginning. Lol. This is why I didn't post the pictures. It's just rehashing what we both already know and disagree on. Comparing the SMB3 map and the SM3DW map I find them very similar in their abstract suggestions of an area as an impression with specific locations just as integrated as squares with a letter or number and felt more strongly in the tiny diaramas of SM3DW. Rather than a minimally suggestive map it's an additional playground with an abstraction of a larger world. It's a different focus. The stages in SMB3 are just as obstacle course with only tangential connection to the map in my mind. SMW is much more representative of what you are saying and I agree I'd like to see a Mario game that focused on that aspect more deeply. Uncovering a world you feel you are enveloped in and pushing through to reach your goal. Different focus, necessarily, than SM3DW which is trying to bridge the 3D play that is so full of fun new things to do but so many forgoe with the more popular side-scrollers that had success with multiplayer. I think it met those goals admirably and it was not the time to implement what you were looking for. Anyway, I think we'd both be pleased — with many others — if Nintendo focused more on a cohesive world of Mario to adventure through in its next iteration and I'd say a lot of signs point to that as a possibility. @aaronsullivan Well I'd be pleased if that happened, and I really hope it does. I don't however imagine it will happen to be honest; or address any of the issues I have, which have been raised on a few occasions. I think it will just be more of what we've seen with the last couple of Mario games—which certainly isn't bad by any stretch of the imagination but isn't quite the pure magic I'm looking for. My thinking is why would Nintendo try any harder when it's clear people are going to lap up whatever new Mario game it puts out. I mean it's not like they're bad games that need major fixes—yet at the same time, I personally don't find them particularly magical or engaging to be honest. The games in the last couple of generations that is. Fun, sure, but it's just a bunch of levels to me. I mean as much as I've always enjoyed playing through the amazing levels in the recent Mario games—it was kind of the complete/whole experience that always captured my imagination. The Mario "World"; if you like. I'm not sure Nintendo is too bothered about that whole experience so much these days—so much as it is about churning out a bunch of fun levels and wrapping them in a bare minimum of presentation and "packaging", as it were. Edit: I guess it maybe all comes down to the Presentation—when I think about it. @Kirk do a lot of games do that for you now though? You are a different person than you were when those you are citing came out. I think Nintendo still cares about the world building. Zelda, Kid Icarus Uprising, Metroid (don't look at FF) Pikmin 3, and even Splatoon do a pretty good job. They are pushing third party collaborators that do this as well. We're in a place where Nintendo really differentiates in local multiplayer party games, though, (with a slow transition to online competitive games?) and little else seems to succeed for Nintendo so you may be right. And it's no secret they weren't ready for the transition to "HD" game development. They have been growing their development teams and I'm hoping they are much better ramped up now. That Zelda game is giving plenty of them training for just what you are looking for I'm hoping. So many question blocks for Nintendo to hit for us in the near future though!